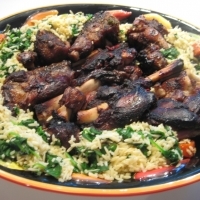 This is a twist on a lamb shank recipe that was in Gourmet magazine about 20 years ago. The orzo and spinach I just throw together because it's easy and it soaks up sauce. Trim all the fat off the oxtails. Season the oxtails and lamb shanks generously with salt and pepper. Heat the olive oil on medium in a pan large enough to fit all pieces flat with some room to turn. do it in batches if you must. Brown all sides of meats until braised, don't burn it and don't burn the oil. Take you time on medium low. While the meat is browning, pour the wine into a sauce pan and cook on medium to reduce by half. Add the broth to this. Arrange the meat pieces in the center of a large roasting pan. Throw the garlic, onions, carrots, celery, bay leaves, and parsley all around the meat. Top the whole meat and veggie thing with the crushed tomatoes. Then slowly pour the wine and stock into the pan along the edges so as not to disturb the nicely arranged meat and vegetables. Cover the pan with a lid or tight fitting foil. Bake at 350 F for 3 hours. Remove lid and stir up the bits gently turning the meat over. Bake for another 30 mins. Strain the liquid in a colander, reserving the broth and carrots (to put with the orzo and spinach). Arrange the meat on a nice big platter and keep warm. Boil the orzo in water for 9 minutes, throwing the spinach on top of the orzo at the very last minute. Drain in a colander. In the sauce pan you used to cook the orzo, mix in the butter and add the carrots. Season with salt. Arrange the orzo mixture around the outer edges of the platter. Serve by pouring the wine sauce on top of the meats. So good just like my Dads recipe. Sounds interesting and different. I don't eat Lamb even tho it always smell so good cooking. I never saw oxtails, what is it?